I received this book in exchange for my honest review. My thanks goes to Lily Markova for giving me the opportunity! In truth, I'm not a believer in life after death or anything like that, but Immortown definitely left me thinking and probably will continue to do so for a while to come. I didn't know what to expect and from what initially started off as serious confusion, turned to fascination as the story progressed and events were explained. I've never read anything quite like it before so, for me, it was certainly unique. Markova clearly has a lot of talent, from the way she writes to the overall tone of her work; the latter being how well she implemented the dark, disturbing feel yet could pull off the occasional humour. Despite that, I feel it took me a lot of effort to read it - I had to pay the utmost attention or I feared I'd miss something relevant; even minor distractions forced me to go over passages more than once. It was easy to lose place of what was happening amongst the lengthy narrative which whilst oftentimes beautiful, also dragged on in other areas. I struggled to rate it, but after some consideration I decided firmly upon the four stars; I really think it deserves such, given my overall enjoyment and the unmistakable thought that's been put into it. Freya Auror was, in short, a troubled character. I know what it's like to lose someone extremely important and feel like letting go, so I could somewhat relate to her in the way that she lost herself to what she enjoyed doing; for her, it was the acting and the roles she played, such as Astra. She was also a woman enthralled by art, which in itself is characteristically attractive as it's so rare this day and age. I didn't particularly understand her connection to Kai, but I think she was the only one to truly see he wasn't the supposed villain everyone thought he was. Yes, perhaps he was a selfish man, but the burning of Immer wasn't exactly intentional. I actually really liked him, even though he wasn't perfect; quite the opposite in fact. He held an air of mystery and attitude that I found appealing. The childish India, her husband Remy and Chace were also good characters and of course, "Dude", who added some comic relief yet still succeeded to be a haunting figure. I wasn't fond of Kristle, but I suppose that was the whole point. Indeed, the entire book was about death and suicide, but it was an intriguing take on things. It wasn't just a typical, simple purgatory tale, but something I found original. As I've already mentioned, the beginning had me scratching my head several times, but I'm glad I didn't let it scare me away. Eventually, it all clicked and that, when you sit back and realise all the ties are coming together and making sense, is a great and satisfying thing to experience. The two PoV's complimented and fit together nicely and the plot itself, whilst not action-packed, still greatly entertained. In conclusion: A very deep and thoughtful read; one I found myself impressed with. 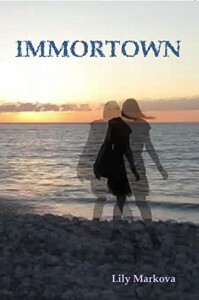 I can't help but wonder about the aftermath of Immortown. Will there be a sequel? It surely looks like it could be continued, so fingers crossed! I'd be very interested in reading more just like this. "You know, when people lose someone, they are horrendously hypocritical. They don't pity the ones gone; they mourn themselves for being left without something familiar or loved."